Today’s readings are from Exodus 21, Luke 24, Job 39 and 2 Corinthians 9. The Mosaic Covenant presupposes this cumulative body of legal literature. So it was not given as a comprehensive legal system to a people living without any laws. Rather, it was a series of instructions God gave—as Israel’s King—for His people to govern their behavior in certain specific matters. This fact explains why the Torah (lit. “Instruction,” i.e., the Law of Moses) does not contain fundamental instruction in many basic areas of law, such as monogamy. The instructions in the Law of Moses confirmed certain existing laws, cancelled other laws, and changed still others, for the Israelites, as the will of God for them. First, Moses is given some laws clarifying slavery. First, a general law concerning Hebrew (kinsmen) slaves is given in 21:2-4, commanding freedom in the 7th year. Then, in 21:5-6 Moses discusses the case of someone who wants to remain a slave, a bond slave, for life. Finally, vv. 7-11 discuss the rights of female slaves. Actually, these rights were pretty amazing when every other culture didn’t even give free women all these rights. I’m reading a book right now called The Civil War as a Theological Crisis by Mark Noll. He argues that prior to and during the Civil War, both sides used the Bible to either justify slavery or abolish slavery. This unfortunately caused a public loss of confidence in the Bible to answer basic questions and rendered religion ineffective for shaping broad policy in the public arena. It truly was a watershed moment that led to the secularizing of American philosophical and political thought. The fact is, slavery was a given in the ancient world (even until the New Testament). Although God never dismantles it, He does regulate it so that it preserves the dignity of those who became slaves. And, the slavery of the Bible was not racially motivated. Luke 24, Christ is Risen! Two unnamed disciples were on the road to Emmaus (24:13-35). We don’t know if they were going home or going to witness to others, or what. David Bivens has an excellent article at Jerusalem Perspective. He believes that they were on the way to Qaloniyeh. 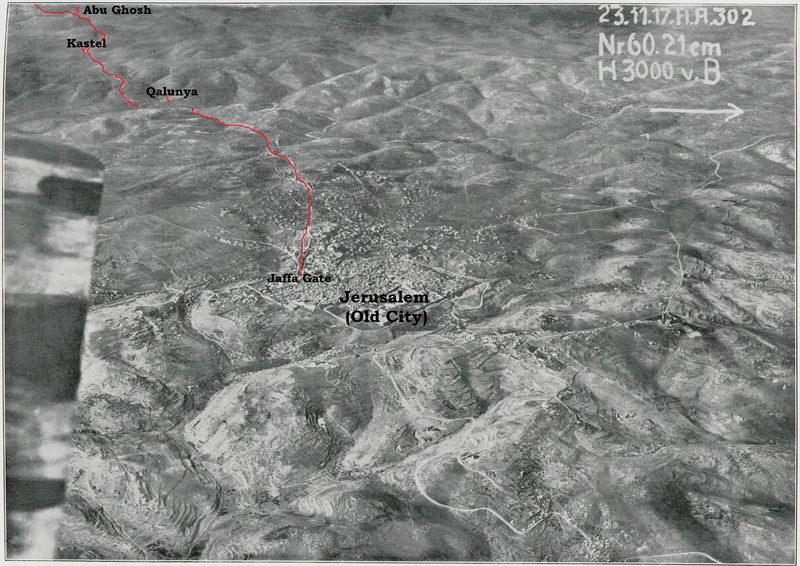 Aerial photograph of Jerusalem’s environs from Gustaf Dalman’s Hundert deutsche Fliegerbilder aus Palästina (Gütersloh: Bertelsmann, 1925). 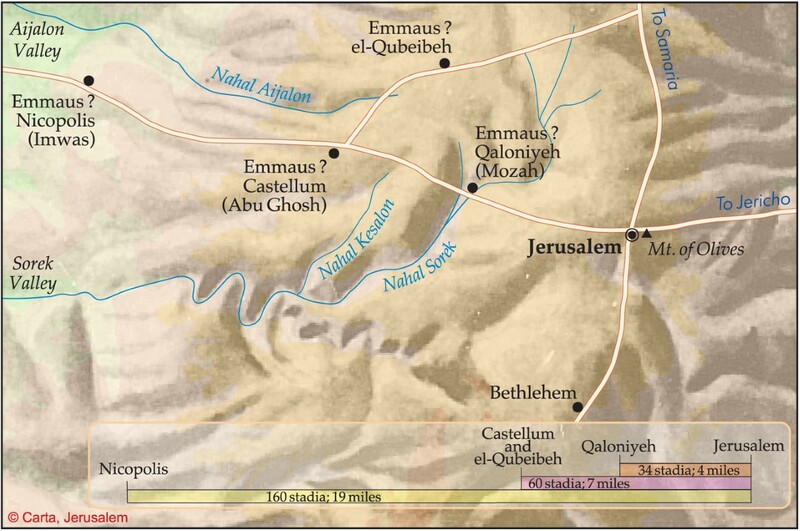 Superimposed on the photograph is the approximate route of the Emmaus-Jerusalem road marked in red. Part of the route is hidden from view as the road descends into the valley as it approaches Qalunya. These two men were discussing what had happened in Jerusalem, likely in disappointment, when Jesus appears. Jesus wanted them to tell Him what they knew. They expressed that Jesus had died and was supposed to have risen from the dead that day, but seemingly did not. Jesus rebukes them for being “slow to believe” and proceded to teach them a unique short course in Old Testament Christology. When Jesus broke bread with them, then their eyes were opened and they realized they had been with the risen Jesus! They reflect how their hearts had been “warmed” while Jesus was speaking to them. So they left back to Jerusalem to tell others. And He instructed them to go out as witnesses and promised them the empowerment of the Holy Spirit (24:48-49; Acts 1:8). In Job 39 God continues to rebuke Job for challenging Him when he understood so little. God had turned to the animal world at the end of chapter 38 and continues it here. God points out six mammals and four birds—only one of which was evidently a domesticated creature in Job’s day: the horse (38:39—39:30). T hey include “the ferocious, the helpless, the shy, the strong, the bizarre, the wild.” They illustrate God’s creative genius and His providential care. The animal world exists for partially unknown reasons, not merely to meet the needs of humankind. People cannot explain why animals live as they do. This is another mystery that only God understands fully. Lion and raven 38:39-41 How do they get food? Goat and deer 39:1-4 How do they bear young? Donkey and ox 39:5-12 How are they tamed? Ostrich and horse 39:13-25 Why do they act strangely? Hawk and vulture 39:26-30 How do they fly? John Piper, in his book The Pleasures of God, indicates that God takes pleasure in his creation, based on Psalm 104:31. When He created it, he rejoiced every day in the “good” quality of His creative work. He takes pleasure in His creation because it reflect His glory (Psalm 19:1-6), wisdom (Psalm 104:24), power (Isaiah 40:26). God’s point in asking Job to consider each of these animals was this. Even upon careful examination, there are many things about their individual characteristics, behavior, purpose, and life that people simply cannot explain. It is quite possible that we haven’t even discovered all the varieties of animals and plants and rocks that God has created. God rarely used legal metaphors in His speeches to Job, which Job had so often utilized. From now on, Job stopped using them. This is an important observation because it shows that the basis of Job and God’s relationship was not a legal one, as Job had assumed. A legal relationship requires just compensation by both parties for what each of them has done to the other. The basis of God’s dealings with Job was gracious, not legal (cf. 1 Cor. 6:7). 2 Corinthians 9 continues Paul’s discussion of giving. John Piper has another video explaining 2 Cor. 6-11. The amazing thing is that God gives on the front and and the back end–we can’t lose when we give! Give as God leads your heart to give.